The process of having a baby isn't always the easiest, especially when it comes to your self confidence. With so many changes to your body, it's easy to become upset about any little comment about your body - especially when it comes out the unfiltered mouth of a child. But Janene Crossley knew when her daughter said her post-partum stomach was like "bubblegum", that it was important to show that it wasn't something that needed repairing, but rather something to be proud of. 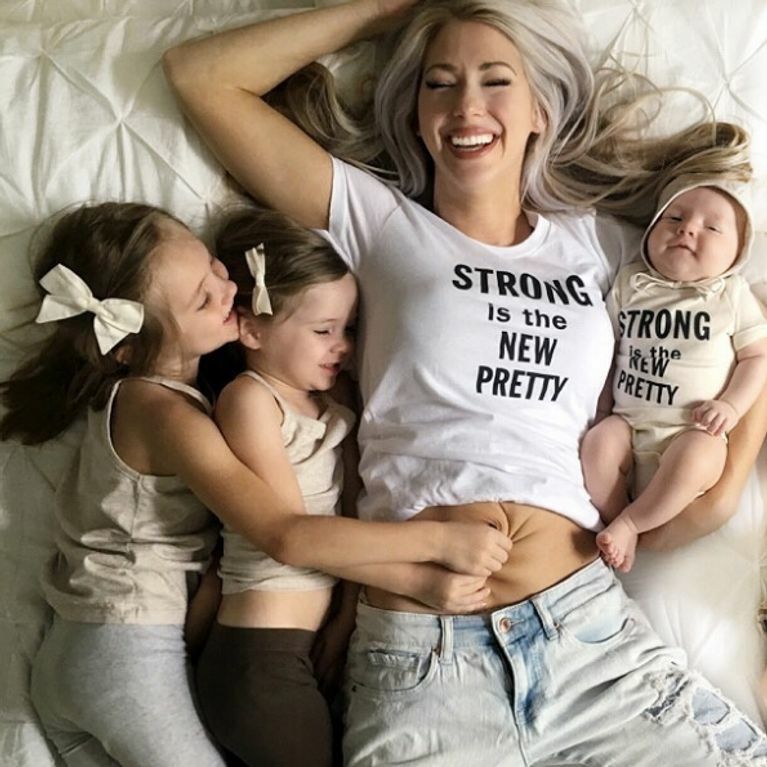 After giving birth to four beautiful babies, Janene Crossley knows that her body has a much bigger purpose than to just look pretty. This body has housed four tiny humans, for crying out loud! But it was only after talking to her daughters that she realised the way she views her body is very different to how they view it. As they were preparing for a photo, her 5-year-old grabbed her stomach, giving it a "big ol' tummy twister" and told her mum that it felt "like bubblegum" as she laughed hysterically. Instead of becoming upset or embarrassed at her daughter's comments, Janene decided to post the "ridiculous, unflattering open-mouth pic" rather than a prettier one that she was originally planning to post. The snap, uploaded to Instagram, shows the Texan mum of four chillaxing on a bed with her two older daughters and her newborn. The two older children are grabbing at the skin on her stomach as Janene laughs. In her caption, Janene goes on to say that she always wants her daughters to feel confident in their own skin as she is in hers: "This belly of mine will forever share my story. It's a novel that pleaded and prayed to house my babies. The fresh, crepe-paper skin means that tiny Avery is nestled in my arm instead of on the inside. My sore chest means that I'm still single-handedly growing this baby." Janene wants her girls to know exactly why she'll never be ashamed of her post-partum body or her 'bubblegum belly': "I'm feeling 100% proud of this post-partum body, with its jelly abs and shriveled up skin. It made me a mother. A mother who now has cellulite because that's just how my body handled pregnancy. This was my road to Motherhood." She finished the post by confirming that yes, of course she'll be making her girls reenact the photo when her girls have bubblegum bellies of their own. And people are loving her confidence. One commenter said, "Thank you so much for this! Brings everything about postpartum body issues into perspective! ", whilst another told Janene her own story: "My daughter told me my belly felt like jello, I just love her and want her to love herself, and when my son grows up I want him to show love, appreciation, awe and respect to the mother of his children. Thank you for showing that postpartum bodies all vary yet are all beautiful."